Savannah vacation homes by Southern Belle are your gateway to see this nostalgic Southern city in a way that is unmatched by staying in a hotel. Our vacation rentals Savannah GA put you right in the heart of historic neighborhoods, giving you an experience more like living in the city vs. just visiting it. However, you won't have to give up hotel-style amenities in our Savannah vacation rentals. Our properties are fully equipped with all the conveniences you would expect, plus lots of space and privacy. Our Savannah vacation homes come in all shapes and sizes, from the very large, to more cozier confines perfect for couple, or individual stays. One of the latter types is the Oak View Terrace apartment. This is one of our vacation rentals Savannah GA that is ideal for a single guest, which might be the perfect opportunity for a business trip stay. This spacious, but cozy apartment overlooks Jones Street and has one bedroom and 1.5 bathrooms over 1,152 square feet. As with all of our Savannah vacation rentals, it comes well-equipped with creature comforts. 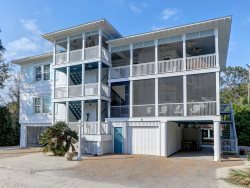 It includes wireless internet, cable TV, a washer and dryer, a queen bedroom, stainless steel appliances in a gourmet kitchen and a private balcony. Starting with the bedroom, the queen-sized bed faces a wide window, giving you a relaxing view at night. The bedroom includes a flatscreen TV on the wall, a ceiling fan and integrated bathroom access. The main bathroom is huge with a soaking tub, standing shower and spacious vanity. The private balcony is one of the best features in this apartment. It offers a tree-lined view with ornate railings and wicker patio furniture. It's the perfect place to relax outside in the morning, or evening. The living room and formal dining room are light and bright with tall windows and ceiling lighting. The living room includes a flatscreen TV, decorative fireplace and two plush sofas. The dining room includes a table for six with a chandelier and a great view outside. Nearby is the full kitchen with tons of counter space and everything you need to cook delicious meals at home. The apartment has wood floors throughout, which are accented with area rugs for a fully modern, yet classic look. The best part is that this apartment is ideally located on Jones Street, which is one of the most desirable places to stay in Savannah. Savannah vacation homes allow you to simply stroll outside your door and be amidst the historic streets and buildings. While all our vacation rentals Savannah GA have great locations, this property is right in the middle of six historic squares. There are several other historic sites nearby as well, including the Andrew Low House, the Mercer-Williams House, the Flannery O'Connor House Museum, the Massie Heritage Center and the Cathedral of St. John the Baptist. The Savannah College of Art and Design Welcome Center is nearby as well. It's hard to beat such a central location. The hugely popular Forsyth Park is also only a short distance to the south. This expansive 26 acre park features fragrant gardens, long walking and jogging trails, places to picnic and much more. Near the park you can find the Georgia Historical Society and the Savannah Law School. At the north end of the district, you can find River Street, which is another can't-miss place to visit in Savannah. Spend the day meandering the long waterfront concourse, watching ships come in and checking out all the shops and restaurants. You can also book a riverboat tour, or dolphin-watching charter from River Street. Walking is typically the best way to traverse Savannah, but you can also enjoy the Chatham Area Transit, or a trolley tour. Due to the central location of our Savannah vacation rentals, you can easily drive to some surrounding areas. One popular day trip for guests is to visit Tybee Island, which is about 30 minutes to the east. This tranquil island is well worth the time, with warm Atlantic beaches, tons of available activities, and an incredible view from the Tybee Lighthouse to the north. Kids will love visiting the Tybee Marine Science Center, and anglers of all ages will enjoy all the opportunities to fish, whether from the dock, beach, or on a charter. Book your vacation rentals Savannah GA with Southern Belle, and enjoy amazing locations coupled with fantastic amenities. We have such a huge selection of Savannah vacation rentals, that it's impossible not to find one that will fit your trip plans. The team was super friendly and efficient. The home is in a great location. Parking was easy and having Clary's available for breakfast didn't hurt. Stayed here when I had to come in for work for a month. Walking into the unit it immediately felt like home. The bathroom is incredible and the balcony is great. The bedroom was super comfy with a big walk-in closet and a big TV. Everything I wanted out of the place.